For as long as I can remember, our family has been enjoying taco salad. 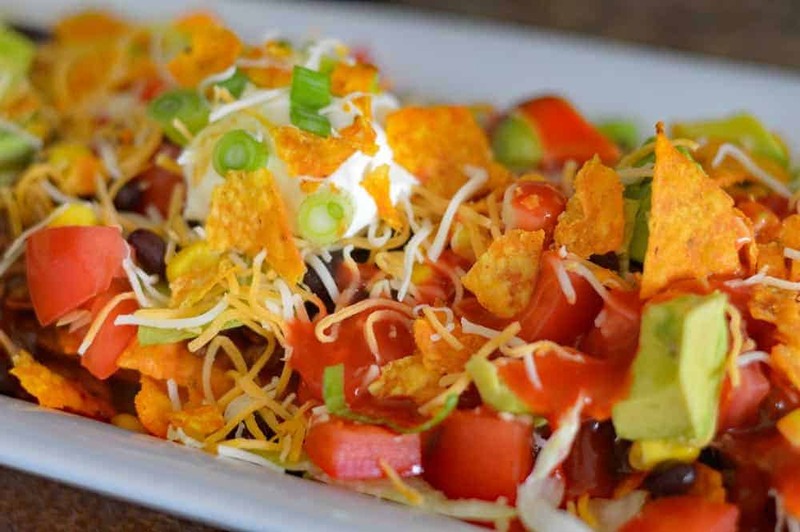 But, the discovery of Dorito taco salad was incredibly intriguing to me. 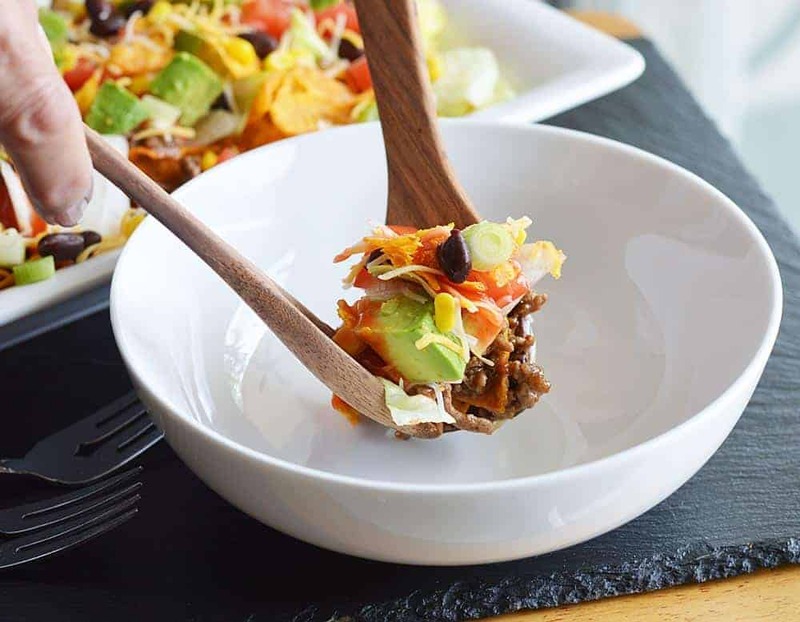 It just so happens that there is one vegan variety of Doritos and therefore, I bring you my version of Vegan Dorito Taco Salad Recipe with Catalina Dressing. Doesn’t it look amazing? 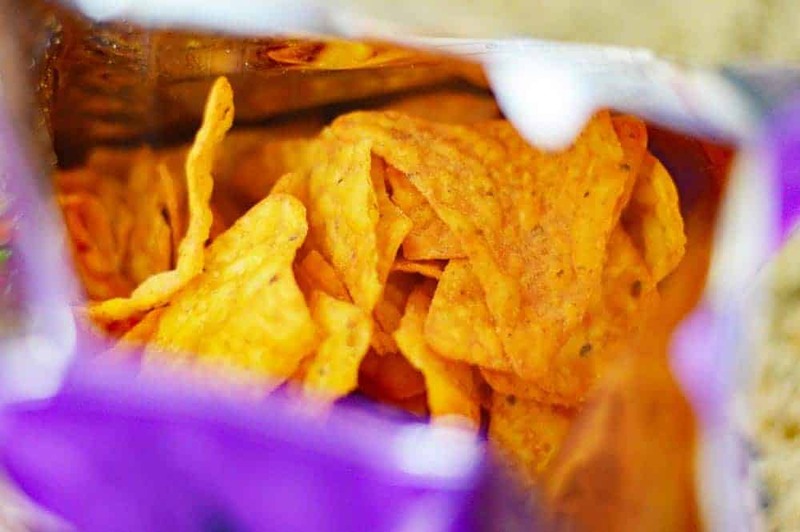 Unfortunately, the classic nacho-flavored Doritos are not vegan. However, it just so happens that the Spicy Sweet Chili version…IS. Just look for the bright purple bag. Gather all of your ingredients and let’s get building our salad! Add what you enjoy. Ours growing up was admittedly pretty darn simple, but I have evolved through the years. Let’s talk about vegan ground “beef” for a minute. I have yet to find one that blows me away, but I had a bit of each of the following three on hand so I mixed them all together! I used Gimme Lean Meatless Veggie Beef, Beyond Meat Beefy Crumbles and Beyond Meat’s Beyond Burger. Use whatever you enjoy. 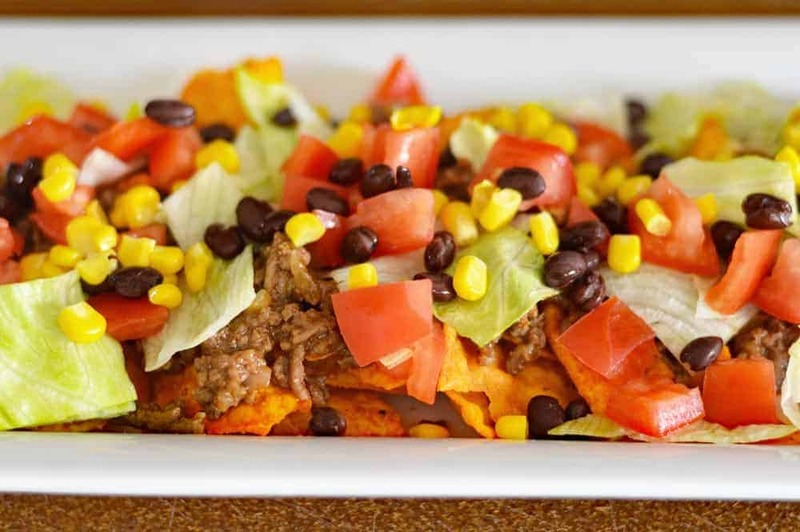 You could also just use a variety of beans or even refried beans. 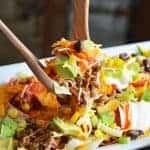 I am using a commercially prepared taco seasoning blend, but it’s also easy to make your own if you prefer. I also used a blend of cheeses. 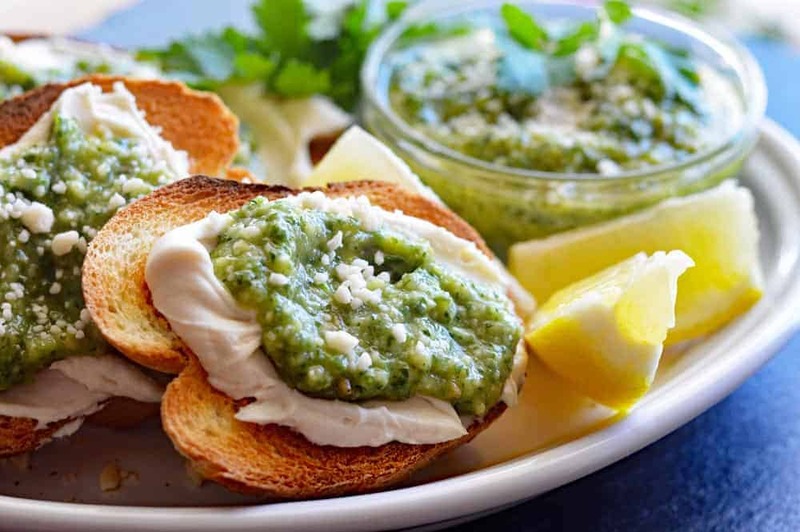 There are SO many vegan cheeses available these days, use whatever you like or can find. Sometimes I’ll take either a block of vegan cheese or a stack of vegan cheese slices and use my microplane to get a finer shred than say, if I were to buy it pre-packaged as shreds if that makes sense. Even more crushed Doritos, vegan sour cream and sliced scallions go on top. 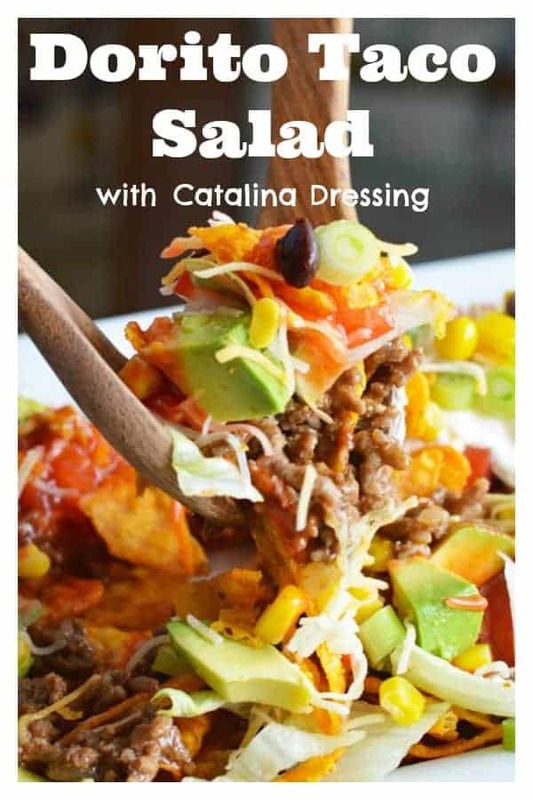 One ingredient we did not use on our Taco Salads back when I was growing up, was Catalina Dressing. Oh my gosh, this was so good. I was a picky eater when I was young and I used to eat this dressing on iceberg lettuce. Period. Nothing else. I had a hard time finding the actual origin of Catalina Dressing. Most sources attribute the original dressing to Kraft Foods which has been producing a Catalina dressing for quite some time now. 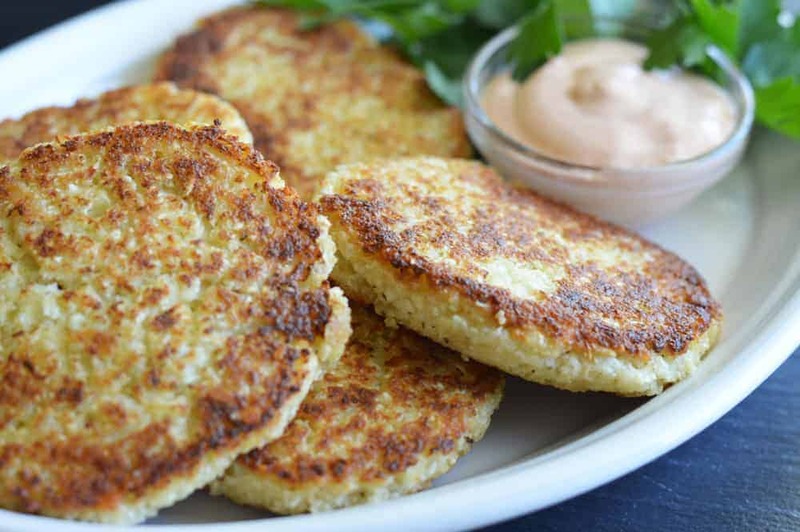 Other claims involve the origin of this dressing as being inspired by (or derived from) Catalonia, a region in Spain where the Catalan people often prepared recipes with a mix of sweet and savory flavors. Who knows? I just know it’s amazing! The only thing left to do is give this all a good toss with your dressing just before serving. 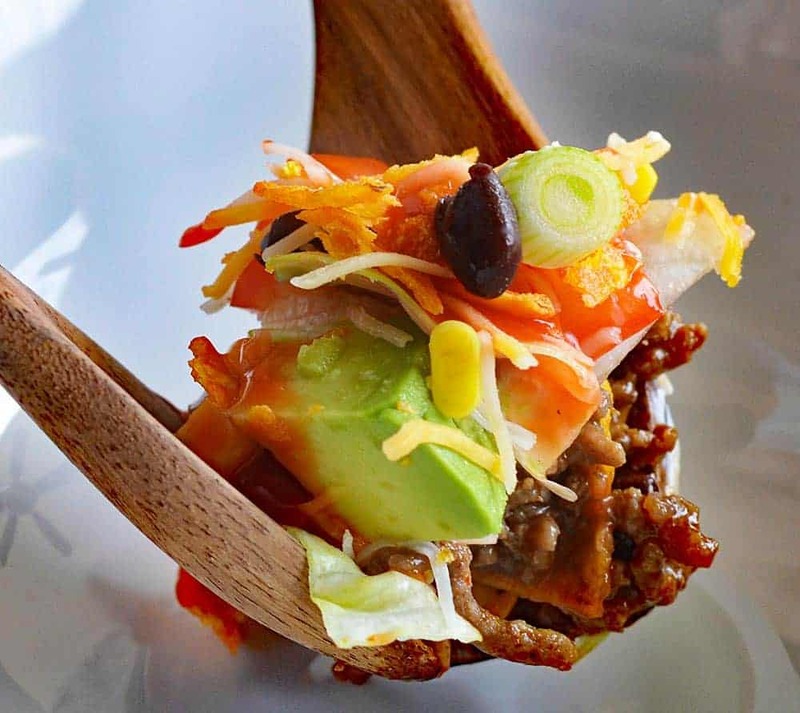 This particular taco salad is meant to be enjoyed with a fork. 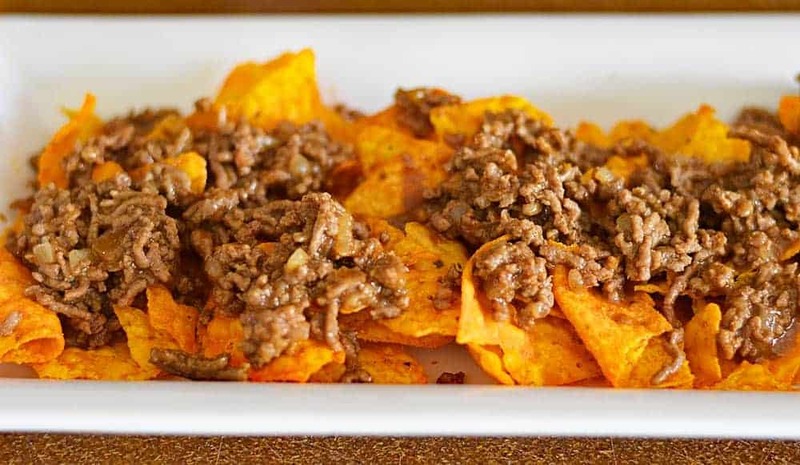 If you prefer a more nacho-style delivery, leave those chips whole. I really loved mixing it all together. A great blend of salty and sweet flavors just the way it was intended. This one was a winner in my book and one I will be making again and again this summer. It’s so easy to prepare and a recipe your guests will love. 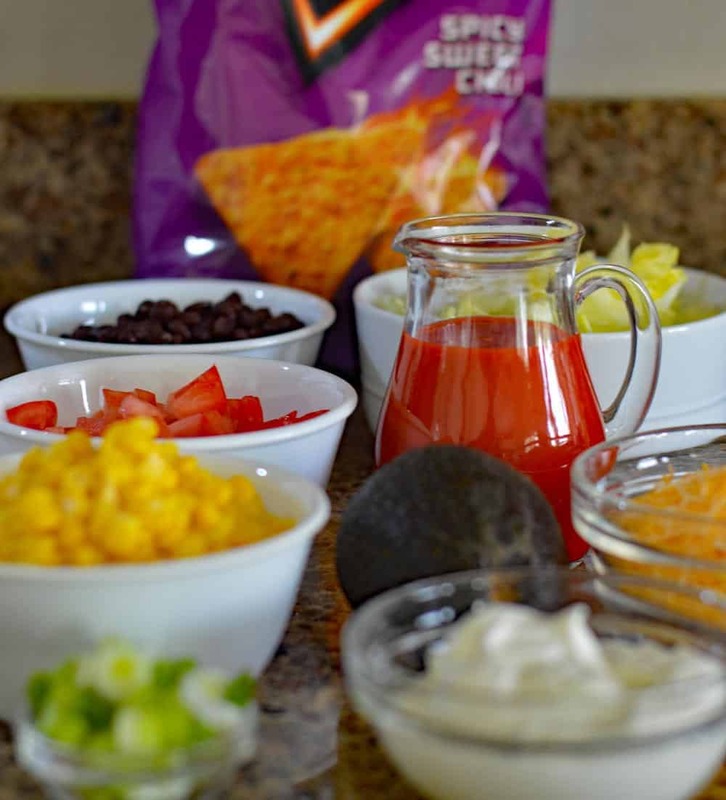 We were just serving a few people, so I tossed ours all together but if you are serving a crowd, you can mix everything except the dressing and allow your guests to do that so the chips stay crispy. After this experience, I think I may start using Catalina Dressing on just about everything! 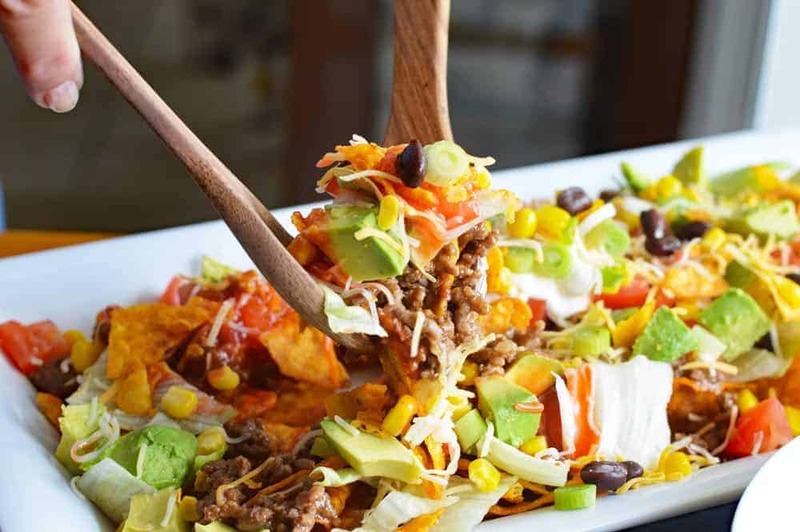 Did you make my Vegan Dorito Taco Salad Recipe with Catalina Dressing? Leave me a comment below if you made this growing up and what you add to yours! 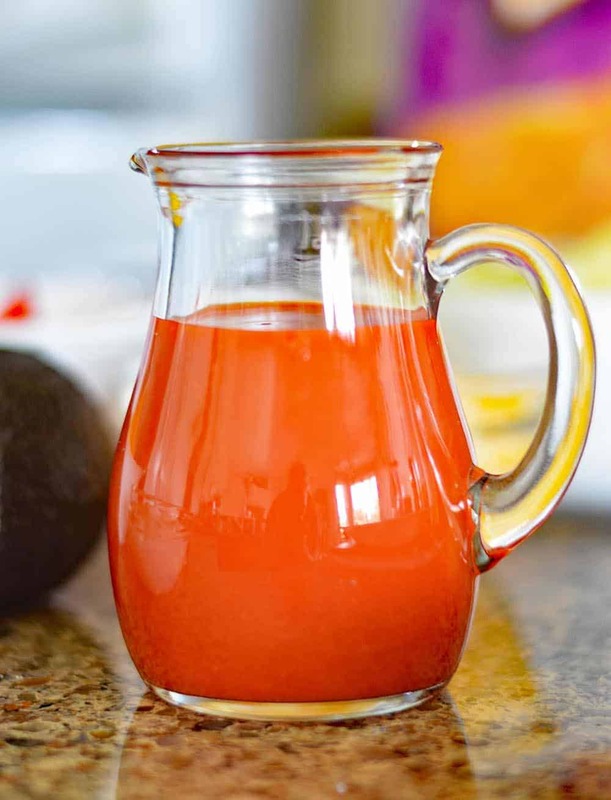 Combine all of the ingredients for the DRESSING (except oil) in a food processor. While the processor is running, drizzle in the oil. Refrigerate until ready to use. 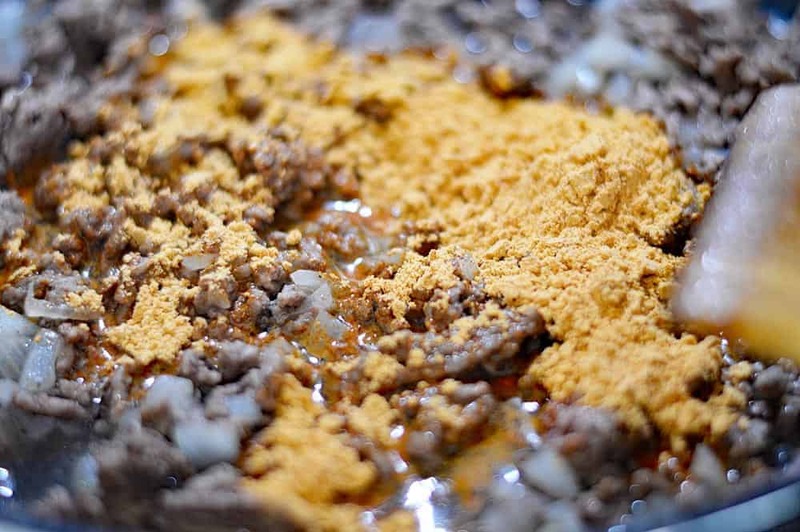 Cook the vegan "beefy" crumbles of your choosing and add 2/3 cup of water and a packet of taco seasoning (or to taste if using a homemade version). 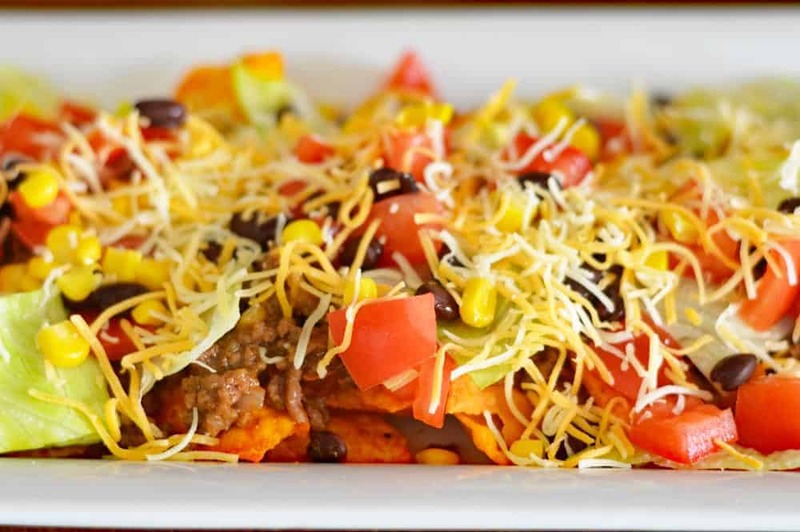 Crush some of the Doritos on a serving platter and top with the "beefy" crumbles, corn, beans, tomatoes and vegan cheese. 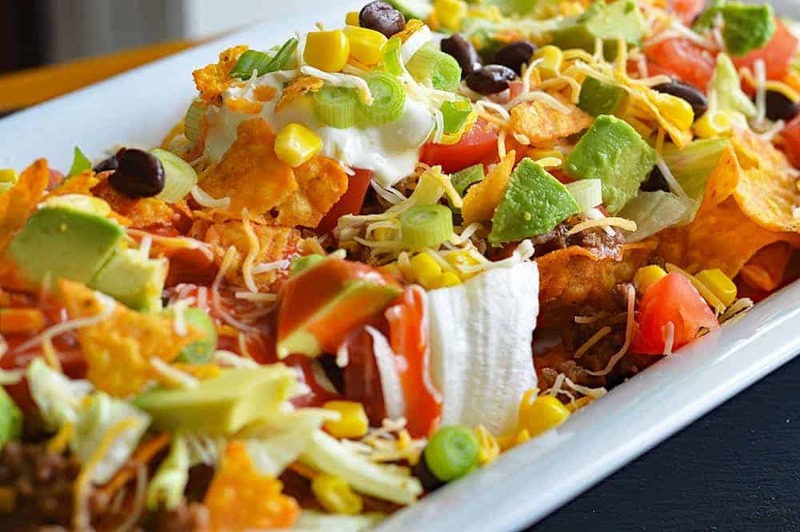 Top with, lettuce, more of the crushed Doritos and garnish with vegan sour cream, avocados and chopped scallions. Serve immediately! How much of the dressing did you mix into the salad before serving? Hi. This recipe looks delicious! You didn’t include lettuce in actual ingredient list? How much is used. Thank you!